Earlier this month, we reported that Michael Jackson’s estate sold his share of ATV/Sony Music Publishing to Sony in order to pay off some of the late pop star’s debts, and the deal included the catalog of Beatles songs credited to John Lennon and Paul McCartney that Jackson has owned since the ’80s. 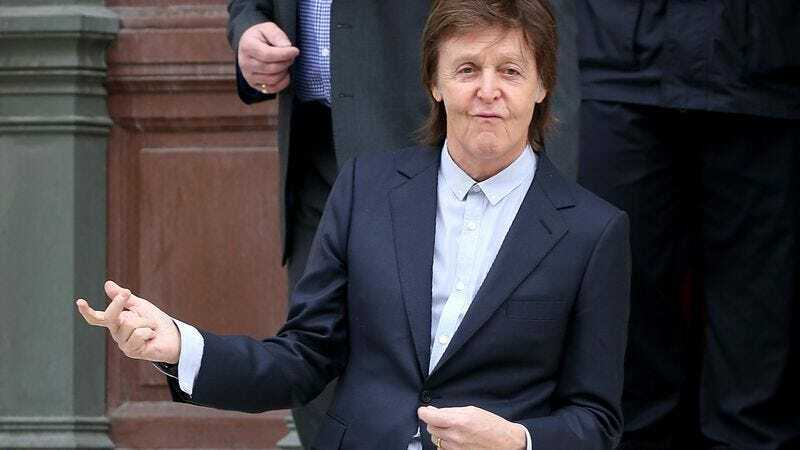 That deal, according to Billboard, opened the door for McCartney to now—finally—get those rights back, but it looks like doing so is a long and complicated process. Basically, The U.S. Copyright Act of 1976 made it possible for artists to regain ownership of their songs from the publishers, but songs written before 1978 (like the Beatles catalog) can only be returned to the original songwriter after a period of 56 years. The first Beatles songs will reach that milestone in 2018, but McCartney has to start working to get them back now because the U.S. Copyright Office requires songwriters to declare that they want the songs back “anywhere from two to 10 years before the 56 years elapse.” (Presumably so the current rights holders can use the remaining time to squeeze more money out of them.) Billboard says that McCartney officially filed with the Copyright Office on December 15, 2015, specifically naming 32 Lennon-McCartney Beatles songs in his notice. Interestingly, though, a big chunk of those songs were actually released later than the others, so they shouldn’t be eligible for this until 2025. Billboard also points out that all of this only applies to McCartney’s half of the Lennon-McCartney copyrights. Apparently, Yoko Ono cut some kind of deal with Sony/ATV back in the day that lets it retain John Lennon’s half of the songs for the entirety of the copyright, which lasts until 70 years after the songwriter dies. The songs are all credited to Lennon and McCartney, though, so that 70-year timer doesn’t even start until McCartney also dies. Who knew copyright could be this much fun!